1. In a medium skillet cook the Bacon until evenly browned. Crumble & set aside. Reserve 2 TB of the Bacon’s fat. 2. Return the 2 TB of Bacon fat to the skillet, stir in the Sugar, Vinegar, Water & Salt. Heat for a minute or two. Cover to keep the dressing warm. 3. Wash the Spinach, removing the stems is (optional). Dry them thoroughly & tear to pieces in a large salad bowl. Pour the warm dressing over & toss until well coated. 4. 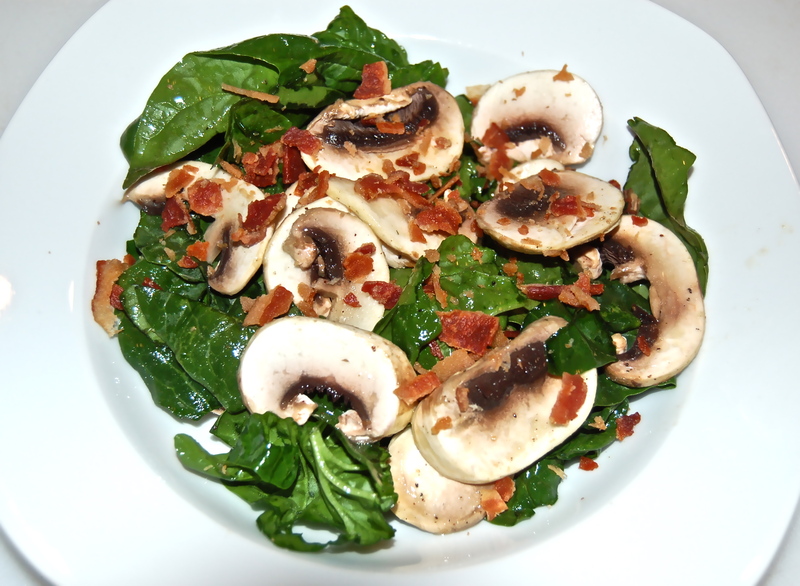 Divide between two plates & top the with the sliced Mushrooms & crumbled Bacon.